I have written about Ireland before, but we need to once again focus on what are not smiling Irish eyes. Ireland was once the envy of Europe, with one of the highest growth rates in the world. It was not long ago that Ireland could borrow money at lower rates than Germany. Now rates are 6% and likely to rise with the new government. Let’s look at a few data points from a brilliantly written article by Michael Lewis, who ranks as one of my favorite writers. When he writes, I read it just for the education on what great writing should look like, as well as for the always fascinating information. The article is at http://www.vanityfair.com/…. • Housing prices in Dublin had risen by 500% since 1994. Rents for homes were often 1% of the price of the home. A $1-million-dollar home went for $833 a month. That is a very clear bubble. • Irish home prices implied an economic growth rate that would leave Ireland, in 25 years, three times as rich as the United States. • In 1997 the Irish banks were funded entirely by Irish deposits. By 2005 they were getting most of their money from abroad. The small German savers who ultimately supplied the Irish banks with deposits to re-lend in Ireland could take their money back with the click of a computer mouse. Since 2000, lending to construction and real estate had risen from 8 percent of Irish bank lending (the European norm) to 28 percent. One hundred billion euros — or basically the sum total of all Irish public bank deposits — had been handed over to Irish property developers and speculators. By 2007, Irish banks were lending 40 percent more to property developers than they had to the entire Irish population seven years earlier. • As the scope of the Irish losses has grown clearer, private investors have been less and less willing to leave even overnight deposits in Irish banks and are completely uninterested in buying longer-term bonds. The European Central Bank has quietly filled the void: one of the most closely watched numbers in Europe has been the amount the ECB has loaned to the Irish banks. In late 2007, when the markets were still suspending disbelief, the banks borrowed 6.5 billion euros. By December of 2008 the number had jumped to 45 billion. As Burton spoke to [Lewis], the number was still rising from a new high of 86 billion. That is, the Irish banks have borrowed 86 billion euros from the European Central Bank to repay private creditors. In September 2010 the last big chunk of money the Irish banks owed the bondholders, 26 billion euros, came due. Once the bondholders were paid off in full, a window of opportunity for the Irish government closed. A default of the banks now would be a default not to private investors but a bill presented directly to European governments. Now, let’s turn to that repository of all things leftist, the UK Guardian, as they write about today’s elections. Let’s think about that for a moment and compare it to the US. We built somewhere between 2 and 3 million too many homes in our bubble, depending on whom you ask. Total Irish population (including Northern Ireland) is 6 million people. If the US had built the same number of excess homes, there would have been 15 million of them! And the banks just kept lending! “So what might a new government seek to do? Its degrees of freedom are, alas, limited. Even excluding recapitalisation of the banks, the primary fiscal deficit (before interest payments) was close to 10 per cent of GDP last year. Under the IMF programme, this is to be turned into a surplus of 1.5 per cent of GDP by 2015. Given the lack of access to private markets, the deficit would have to be eliminated even more quickly without the official assistance. Again, the debt overhang would be huge, under any plausible assumptions. Ireland is doomed to fiscal stringency for decades, given its poor growth prospects, at least in comparison with its Tiger years. “Apart from the Armageddon of a sovereign default, two partial escapes exist. The more trivial would be a reduction in the rate of interest on Ireland’s borrowing: a 1 per cent reduction in the rate of interest would save the state 0.4 per cent of GDP a year. That would be a small help, at least. A more valuable possibility would be a writedown of existing subordinated and senior bank debt, which currently amounts to €21.4bn (14 per cent of GDP). There are a significant number of Irish voters who wonder why they should pay any of it. Not the majority (yet), but enough. This is the Maginot Line for the ECB. If they renegotiate with Ireland, then Greece will be at the door in a heartbeat. Ditto for Portugal. As one story I read about Ireland said, “Parties we go to now are going away parties as people, especially young people, leave for other countries with better opportunities.” The mood of the country will grow more dour. Look at this chart. Notice how well Iceland did after it simply repudiated its debt. It wasn’t easy, and inflation is brutal, but they are better off than if they had taken on a debt burden that would have made them indentured servants to British taxpayers for decades. 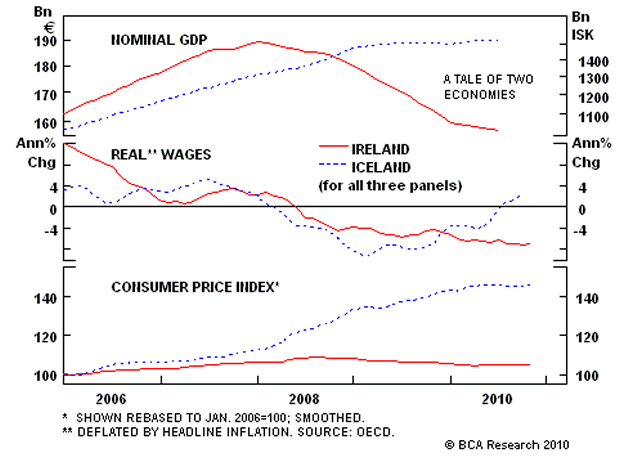 The ECB, the IMF, and the rest of the EU is asking Ireland to willingly fall into a lengthy depression. Would walking away from the debt, or restructuring it, be any worse? What if the opening negotiating line started was, “We will repay the principle, but no interest, and the timeline has to be stretched out over 25 years?” And no payments for five years. Oh, and we have about 300,000 houses you can have as our first payment. Yes, the Irish would be frozen out of the bond market. It would result in an even more serious recession. But they could actually grow their way out of it over time. A lot faster than if they were trying to pay off the debt at 6-7% interest. And remember that Argentina, for God’s sake, got money just a few years after defaulting – twice, if I remember right! If Ireland got back on a sound footing, they could once again find acceptance in the bond market. I know, that sounds radical. But give it a few years of austerity and see what the next elections bring. Irish debt will default, not because the Irish don’t have hearts of gold or don’t want to not pay their debts, but because they are under such a burden they can’t. And eventually enough voters will realize that. It may not be next month, or even next year, but it will come. You can only ask so much of a people. Defaulting on sovereign debt is only unthinkable in elite European Union circles. And asking German voters to pay for those defaults? Care to run on THAT platform? This has the potential to really roil the debt markets, not to mention the interbank markets. The US is doing ok, except that job creation has been slow. A European debt crisis could throw a wrench into the world gears. And that is the heart of the problem. The Irish really do want to do the right thing. The Greeks, not so much. Portugal? Spain? The leadership of the EU is living in denial if they think that more debt is the answer to too much debt. It is all well and good for the Germans to tell everyone to cut back (and they should) but to do so means that the countries go into recession and have even less money to pay their debt burdens. They get into a debt spiral and the only way out is restructuring, which is default by a nice name. Somewhere, sometime, this is all going to end in tears. The EU will be better off restructuring the debt, letting insolvent banks go the way of all flesh, or financing them and letting the euro drop like a stone, which will only make their exporting companies more competitive (not good for the US and China, but we don’t get to vote in the EU). Or they can break up. I think the former is better than the latter, but that’s just me. The world went crazy with debt. The US, Japan (where I fly to in less than 12 hours), much of Europe, and Great Britain. And now we have to deal with it. Acting like adults would be best, and recognizing that some countries just can’t assume their banking debts is just being realistic. A lot of people made bad choices and now those choices are coming home. It is all so very sad. People are hurting. I read the blogs in Ireland and it brings tears to me Irish eyes (or the large part of me that is of Irish heritage). There are no easy answers. No easy button. The only button we have is the reset button, for the Blue Screen of Death. That means pulling the plug and starting over. This time with realistic debt levels and bond markets. Have a good week! Sayonara for now! I tried to tell people at the doors about this and got nowhere somehow they had their minds made up that Fine Gael was the answer and that getting new faces into power was going to solve the problems of our country .I suppose we are going to have to wait until people realize that the new crew on the “good ship SS Ireland” are just as incompetent as the last crew. Committing to more debt is not the answer we just can’t pay off this huge private debt and the taxpayers will only face more job losses and social services cuts the honeymoon period will be short and we will be in the divorce courts soon enough mark my words! The people have spoken and have once again put back in mostly the same old tired void of real ideas politicians .They will regret this soon enough as we start to see the price go up for petrol and the tolls start to bite on the roads, pay for the privilege of walking in a local forests .and the selling off of state assets like the ESB and VHI. The cost of renewing you passport to getting a birth cert all local services will now start to creep up in costs while the services themselves will be cut to the bone. But it would seem to be a temporary job done! at least they did something! 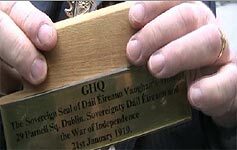 That caption appears on the base holding the seal and it describes what happened in the year 1919 at Vaughan’s Hotel – a haunt of Michael Collins and other revolutionaries of the War of Independence. It was also the secret headquarters of the first Dáil Éireann. Every year since then, a member of the Maguire/Mcguire clan – the designated keepers of the seal- arrives at the official residence of the mayor, Mansion House in Dublin, to perform this little known Irish ritual which according to the records must take place and be witnessed in order for the sovereignty of all the organs of the state including the Dail, the courts, licenses and even of the nation itself to continue. Thus, at 12 noon in the Cabinet Room, with a harp playing softly in the background, the Sovereign Seal is turned once again. The tradition has been passed down from generation to generation of McGuires. Today, Billy McGuire of Askeaton Co, Limerick performs the duty first carried out by his ancestor Tom in 1919 and then later by his father. Billy took it over from his late father in 1967. Extrapolating the facts behind this annual ritual from a number of sources immediately raises some questions: First off – why is it that the McGuires perform it? The obvious answer would be that it was because the McGuire family were the owners of the hotel where the ceremony first took place. In 1917 the McGuires acquired Vaughn’s on behalf of the Irish Republican Brotherhood – a secret oath-bound fraternal organisation dedicated to the establishment of an independent democratic republic and to Oglaigh na Eireann (Soldiers or Volunteers of Ireland). In 1918, the hotel was the site of the 32 county Election which established the sovereignty of the Republic. On the morning of January 21st the Irish Republican Brotherhood implemeted the 1916 Proclamation which vested the soverinty of the 32 counties and the democratically elected TDs to Dail Eireann. However, it should also be noted that the surname McGuire and its variations has a long and illustrious history in Ireland which would make it worthy of performing such an important ritual. The family is first mentioned in the Annals as early as 956 A.D. Towards the close of the thirteenth century, with the installation of Donn Maguire, the family began to feature prominently in the records. Between that time and 1600 there were fifteen Maguire rulers of Fermanagh. Following the devastations by the armies of Cromwell and William of Orange, the Irish landed aristocracy, including the majority of the McGuires fled, in 1691, with the “Wild Geese” to France and Austria and a member of the family accompanied the Earls O’Neill and O’Donnell to Rome. The Mcguire titles, which died out in about 1795, were acceptable to the French court to which they had given their allegiance while serving in the many Irish regiments. Maguires appear in the archives of Europe’s capitals, from Paris to Copenhagen and from Madrid to London. John Francis Maguire (1815-72), the son of a Cork merchant, founded the still popular Cork Examiner newspaper and played a major part in politics – he was Mayor of Cork four times. In 1880 Thomas Maguire was the first Catholic to be made a fellow and was Professor of Moral Philosophy at Trinity College. Sam Maguire served Michael Collins as intelligence officer and later was important in the GAA both on the field and in its administration. Considered by many to be the GAA’s founding father, Sam always wore the Sovereign seal on his jersey; the Sam Maguire Cup awarded to the winners of the All Ireland Senior Football Champions is named after him. Other questions remain unanswered as of this writing. 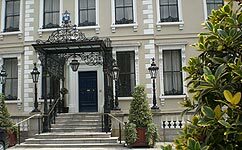 Does ‘The Keeper of the Seal’ bring it with him to the Mansion House each year and then takes it back with him after the ritual is performed? And is the seal that is turned the original one from 1919? It would appear from some of the videos in which Billy McGuire appears, that the seal goes with him where ever he does. But it’s not known for certain if it’s the orginal. The plan is to investigate further and try to fill in these gaps. 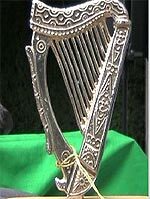 The Irish sovereign seal consists of a harp with 12 strings. The Harp is a symbol dense with meaning. In form it incorporates the ships compass, the horizon, the moon, the triangle and parallels of geometry and as such is an ancient compendium of knowledge. The Romans followed the Harp in their design of Rome. Its importance in Ireland for ceremonial and later official use makes it, as a symbol, key to Irish civilisation and history. Variations in the number of harp strings make their appearance on a wide range of Irish documents and other items. For example, there are eight strings on the harp symbol of the Army, 9 strings on the passport’s harp, 13 on official documents of Dail Eireann and 14 on coins. In court our judges sit under a 13 string Harp which is in reference to the Trinity (one in three) and ties their work to the Irish Constitution. Historically, the Sovereign Seal of the Irish Republican Brotherhood had 6 strings while that of the Fenian Brotherhood had 5. Billy McGuire, who is the current President of the Republican Brotherhood, invests in all of this a great deal of important symbolism, and indeed, has tried to reprimand the president for flying a standard containing a harp with the wrong number of strings. And, according to Mr Maguire, peace in Ireland will not be truly reached until the British monarch removes the Irish sovereign seal which still takes up a quarter of the royal standard. Not many people know that. It is also a strange anomaly of Irish history that the Seanad sit with their back to the Sovereign Seal which is on the back of their chairs. This happened because members of the house initially sat facing symbols of the British Crown. This practise is something that Billy McGuire would also like to see changed. What this writer finds curious is why this custom receives so little attention. 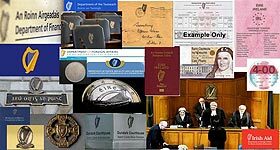 Somewhere in the pile of notes there is a notation that the turning of the seal is what grants a licence from the people of Ireland to the government to perform as they, the people, desire. Yet strangely, there seems to be an obvious absence of political leaders at the ceremony. Did they attend at one time and then, once Ireland became a Republic decided they didn’t need to anymore? Delving into the notes simply raises more questions than it answers. But one thing is for certain: there is an old Irish proverb that says “Never make a custom or break a custom.” Given the somewhat tenuous circumstances of dear old Eire today, this writer would be making sure she was in attendance at the Mansion House every January 21st to witness and celebrate what is essentially Ireland’s Independence Day. Perhaps a nice fireworks display over the GPO would be a grand touch as well.